The Pond is in a secluded forest clearing where birds are singing, the trees are swaying in the breeze, and if you listen carefully, a cow is mooing somewhere in the distance. In the center of this clearing is a pond, and in it seven speckled trout are swimming. You touch the surface of the pond and water waves ripple at your fingertips. The fish become curious at this disturbance and come to investigate. If you can touch one of the fish it will dart off to safety. 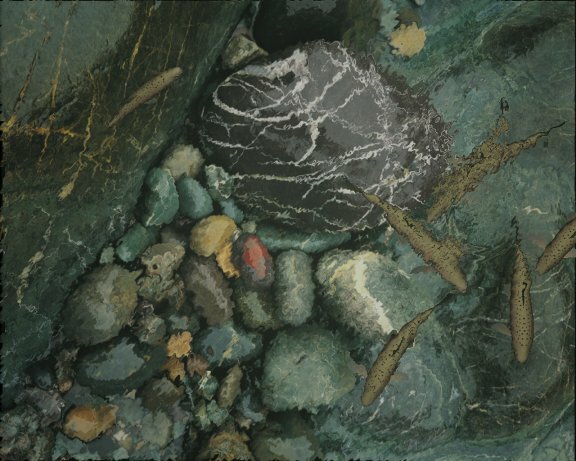 The Pond is actualy a computer-generated environment. 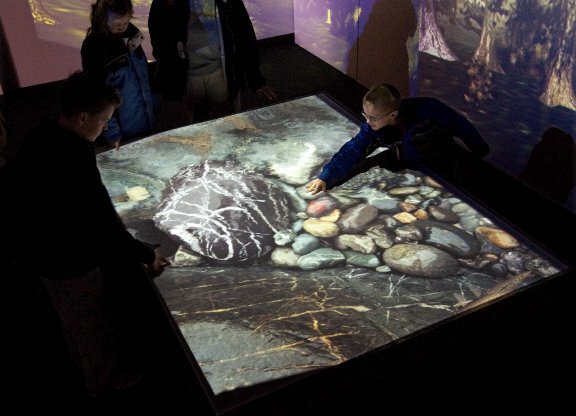 It uses projectors and surround-sound audio to create a real place - a serene place you might want to visit. Although hidden from view, there is a lot of technology behind The Pond. 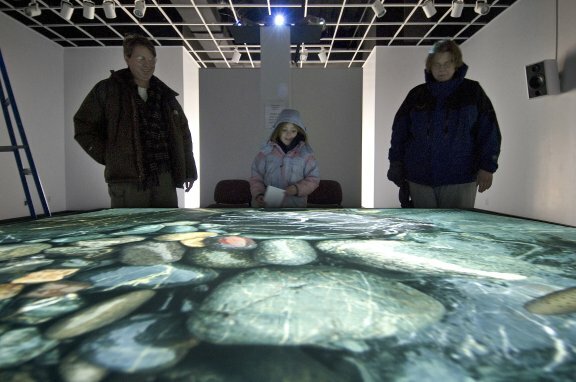 Three projectors are used to create a panoramic forest that is 8' high and 30' wide. 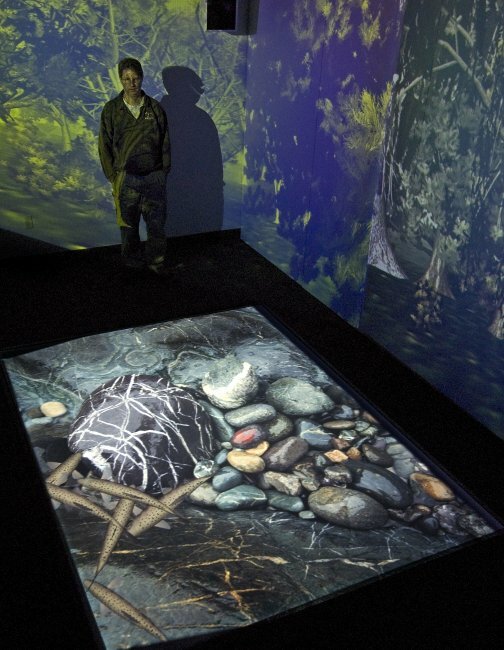 The forest wraps around three gallery walls - it surrounds you as would a real forest. Another projector mounted in the ceiling creates the pond surface. The pond itself is a real-time 3D world and is made the same way as a 3D computer game. 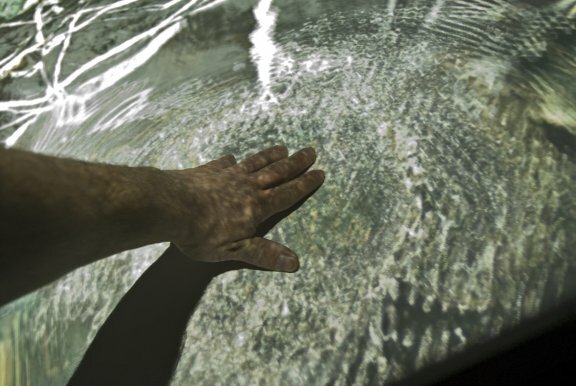 The rippling water is also generated in real-time so the fish swimming underneath are distorted as they would be in a natural pond. Behind the pond surface are more than 3000 touch sensors. They tell the computer generating the pond the location of your touch. 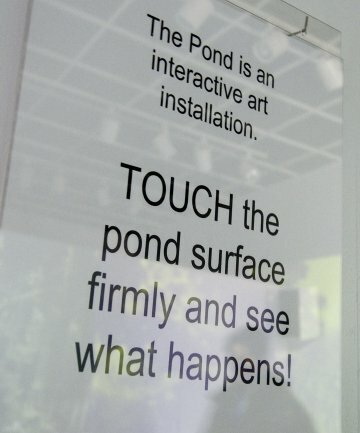 This technology makes the pond surface act like a large touch screen and makes the pond interactive. An audio system plays ambient sounds of singing birds, and also plays splash sounds when the water is touched. 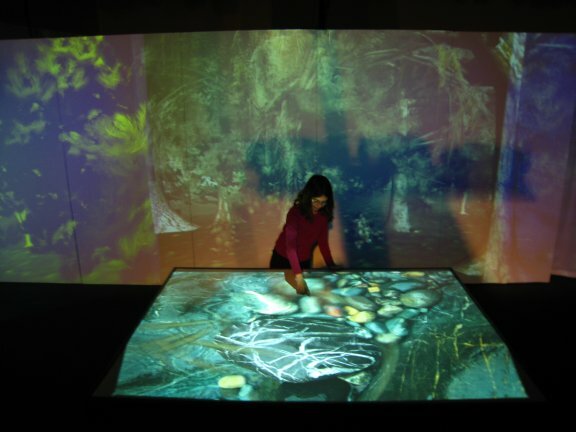 The Pond is a multi-media landscape that interacts with you much like a natural environment. It is fun for me to watch people interact with The Pond. Children especially tend to react with wonder and amazement that this thing is responding to them. The boy in the photograph was quoted as saying: "The waves make my eyes go bonkers, It's cool." Here is a ponds-eye view facing away from the forest. Yes the people are wearing down parkas. This is Minnesota in February after all. This is a photograph of my daughter trying to touch a fish and see it dart away. I took this one myself, hense the relatively poor quality. These environments are incredibly hard to photograph. This is a screen-grab generated from the 3D graphics application that generates The Pond. I pretty much wrote this software myself. It has evolved over several years, and this time I added the animated fish. Professional 3D games animators and coders now have my unwavering respect. Getting seven fish to swim together, behave naturally, and look convincing is one of the hardest things I have ever done. I perturbed the water surface before grabbing this screen-shot. Copyright 2008 Bill Klaila. All rights reserved. Photos by Mark Trockman unless otherwise noted.